Leonardo Di Caprio paid tribute to Jane Russell for The Aviator, in which he portrays film mogul John Hughes. 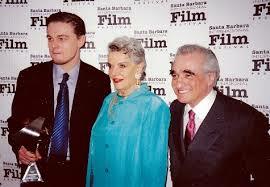 In the picture Leonardo Dicaprio (Left) Jane Russell (Middle) and Martin Scorsese (Right). 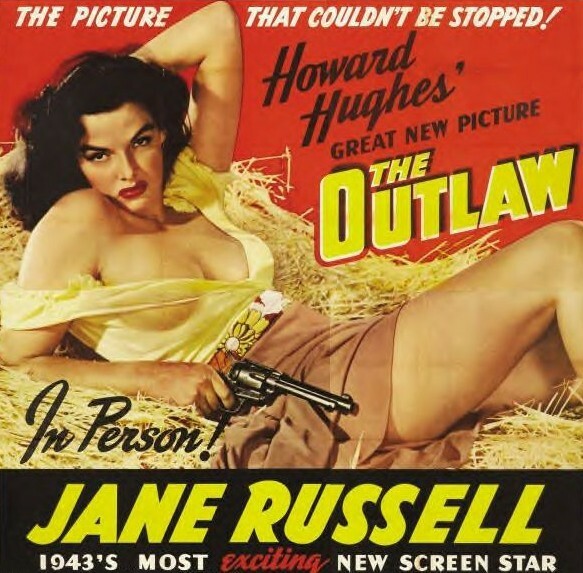 From Wikipedia: In 1940 Russell was signed to a seven-year contract by film mogul, Howard Hughes, and made her motion-picture debut in The Outlaw (1943), a story about Billy the Kid that went to great lengths to showcase her voluptuous figure. Although the movie was completed in 1941, it was not released until 1943 in a limited release. It finally was released to a wide distribution in 1946. There were problems with the censorship of the production code over the way her ample cleavage was displayed. When the movie was finally passed, it had a general release in 1946. During that time she was kept busy doing publicity and became known nationally. Contrary to countless incorrect reports in the media since the release of The Outlaw, Russell did not wear the specially designed underwire bra that Howard Hughes had designed and made for her to wear during filming. According to Jane’s 1985 autobiography, she said the bra was so uncomfortable that she secretly discarded it and wore her own bra with the cups padded with tissue and the straps pulled up to elevate her breasts. 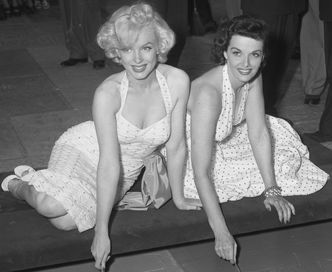 This entry was posted in 50S, 60'S, actresses, film, Hollywood, Jane Russell, Marilyn Monroe, Marylin Monroe and tagged 50s, 50s Hollywood, 60s, film, hollywood, hollywood walk of fame, howard hughes, Jane Russell, Leonardo dicaprio, Marylin Monroe, Movies, old hollywood. Bookmark the permalink.